He/she slowly walking toward me while I was weeding. The striking yellow spots on its head caught my attention, and out came the camera. Snap, snap, snap! Click, click, click! When I saw the stripes on its head, I knew straight away that it is in some sort of white-crowed sparrow family. So I Google it! It was identified as White-Throated Sparrow. For bird lovers, you can find out more information by clicking on the link. 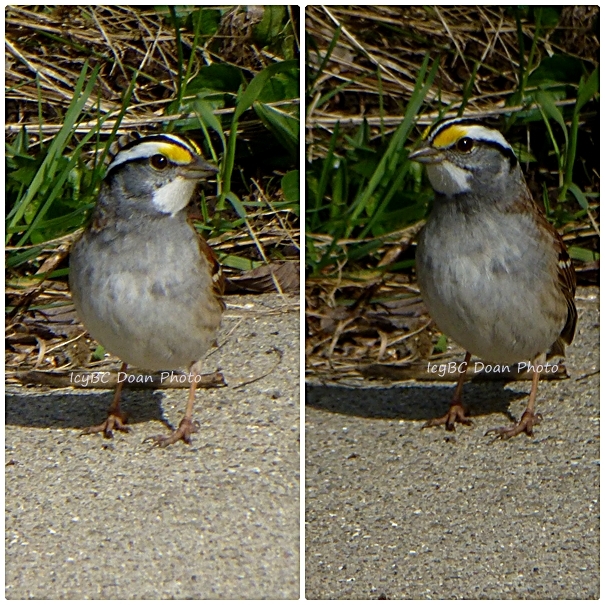 This little pretty white-throated sparrow made me so happy to see. It seems to rather staying on the ground to feed, or looking in the grass than eating straight from the feeder. Icy, it is precious. Sparrows are my favorite birds and these shots are awesome! You have managed to capture he/she so beautifully. I love these little guys, great shots! Wonderful shots of the WT Sparrow! They are pretty. Happy Weekend! Such a pretty little character! I have never seen one like this! Fantastic profiles! Fantastic photos! These are one of my favorite sparrows. Absolutely stunning!!! I think that striking mark on the sparrows head would definitely catch my eye too!!! Nice post for the bird-theme! He is regal and quite deserving of his crown. Lovely capture, Icy. Lovely captures and such a pretty sparrow.